For years, Al Fin engineers have been saying that the quickest approach to convert algae to fuels economically, is via pyrolysis of algal biomass, rather than via harvesting of algal oils for biodiesel. Although the technology described below is not exactly what Al Fin specialists have described, PetroAlgae is partnering with CRI Catalyst in a novel pyrolytic approach to biomass-to-fuels, which may achieve economic break even first. IH2 is an advanced pyrolysis technology which utilizes low pressure hydrogen together with a proprietary catalyst to remove virtually all of the oxygen present in the starting biomass...The technology is highly flexible and is economical for both small- and large-scale applications, according to CRI. ...CRI is a provider of catalyst and environmental systems technology to the global petrochemical producing community. PetroAlgae’s micro-crop technology employs indigenous, aquatic micro-organisms suitable to local climates and is designed to enable its licensees to produce a high-value protein product and residual biomass which may be converted to cellulosic hydrocarbon fuels and/or blend stocks via the IH2 technology at commercial scale. This agreement is a direct result of successful tests converting PetroAlgae’s micro-crop residue into cellulosic hydrocarbon fuels and/or blend stocks using the IH2 technology provided by CRI. The two firms have agreed to continue to optimize the combined capability of their respective biomass production and conversion processes. Using duckweed as feedstock is an interesting choice, since duckweed is a high-yield plant crop that grows on the surface of ponds much like algae. But algae is a more prolific biomass crop than even duckweed, and I would not be surprised if Petro-Algae begins to use the IH2 technology -- or something very much like it -- for converting algal biomass to fuel. Eventually algae growers will develop strains of algae which produce abundant oil which is easily and economically harvested. At that point algal biodiesel will hit the markets like gangbusters. Producers will then separate the oil for fuels, and use the biomass for secondary products such as feed, food, fertilizer, etc. But for now, the most salient aspect of micro-algae is the prolific nature of its biomass production. That, and the ability to grow fast-growing algae in saltwater, brackish water, wastewater, etc. Why not take advantage of that characteristic now, while others are developing high-oil strains and cheap oil-extraction methods? Growers can aim for high biomass yields in dirt-cheap open ponds, using non-potable water, and without worrying about maintaining monocultures. 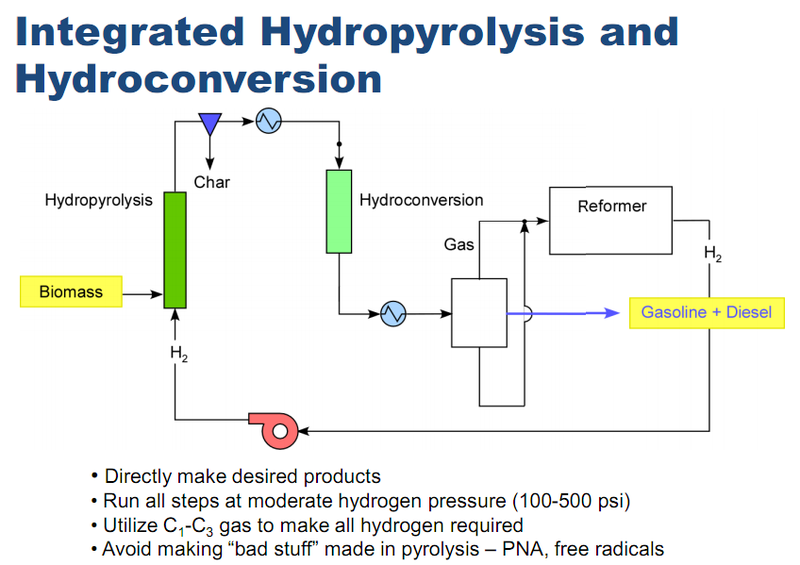 With reasonably cheap harvesting and drying methods, pyrolysis methods such as Petro-Algae and CRI's IH2 should produce a fuel with many uses. Algae ranks up there with fusion. Algae is a low density approach to making fuels, but one can find species that are suitable for almost any climate and type of environment on the planet. As you suggest, it is not a question of choosing one over the other. Our bets must be hedged widely.